Sabine Schut-Kery rode Sanceo to the Prix St. Georges Championship. Pictured with owners Alice Womble-Heitmann and Dr. Mike Heitmann, ground jury members Jane Weatherwax, Sandy Hotz, Christel Carlson and Markel owners Lisa and John Seger. 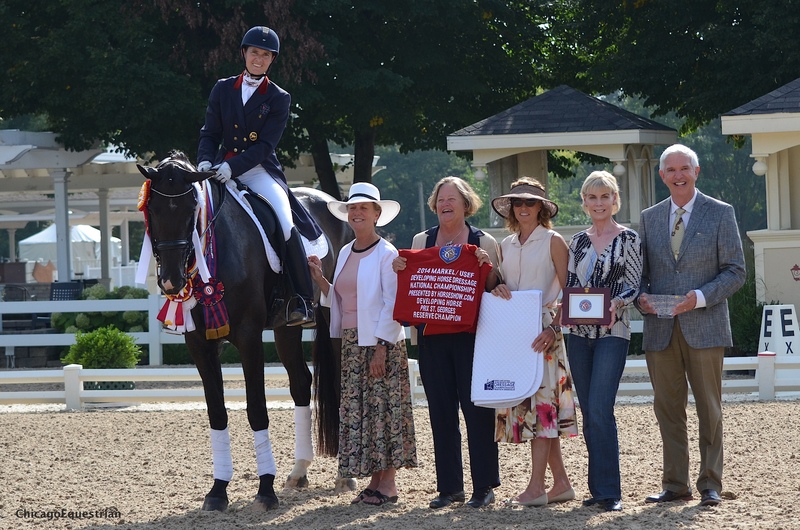 Wayne, IL – August 24, 2014 - Sunday's competition came to a close awarding the last of the Championships at the Markel/USEF Young and Developing Horse Dressage Championships at Lamplight Equestrian Center. 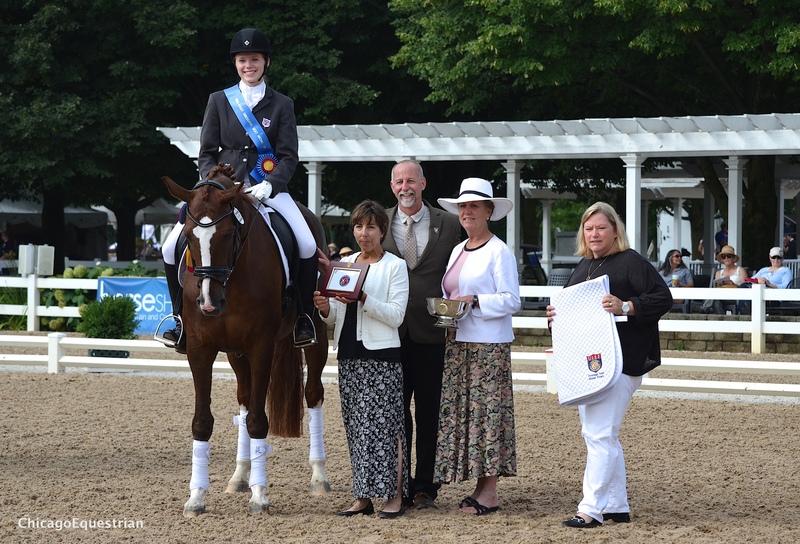 Presented by HorseShow.com, the final Championships were awarded for the Developing Horse Prix St. Georges, the FEI Six-Year-Olds and the USEF Dressage Seat Medal Final 14-18. Gold medal winner in the Dressage Seat Medal Final was Bronwyn Cordiak. Medal riders took to the ring promptly at 8:00 am for the medal final to be tested by working on the flat as a group and then performing individual tests. Fourteen riders then anxiously awaited the judges' decision with the final three riders held in suspense in the center of the ring. Returning home with the gold medal was Bronwyn Cordiak, 16, of Argyle, TX. Cordiak rode Dschingis Blue to a score of 90% to win with the help of trainer, Bre Dorsett. The horse and rider team has been together for two years now and currently compete in third level dressage. Cordiak hopes to move up the ladder to the Young Rider's Program and eventually to the Brentina Cup and possibly some international competition. Madeline Joy won the silver medal in the Dressage Seat Final. 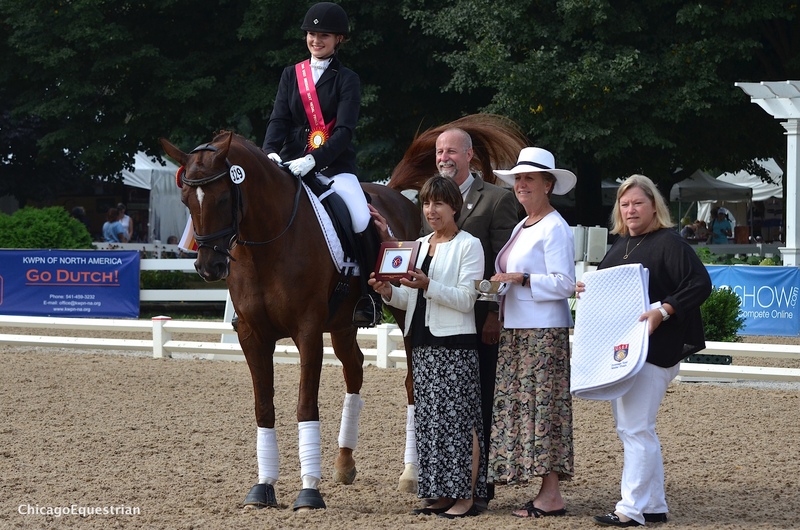 Madeline Joy, 16, took the silver medal back to Enumclaw, WA with her trainer, Gwen Blake. Joy rode Fein Hardt in the prestigious class, earning 86%. Joy borrowed the 14-year-old mare from Kim Rhind and only started riding the horse earlier this week. "It's an honor to be here and be in this class," said Joy. 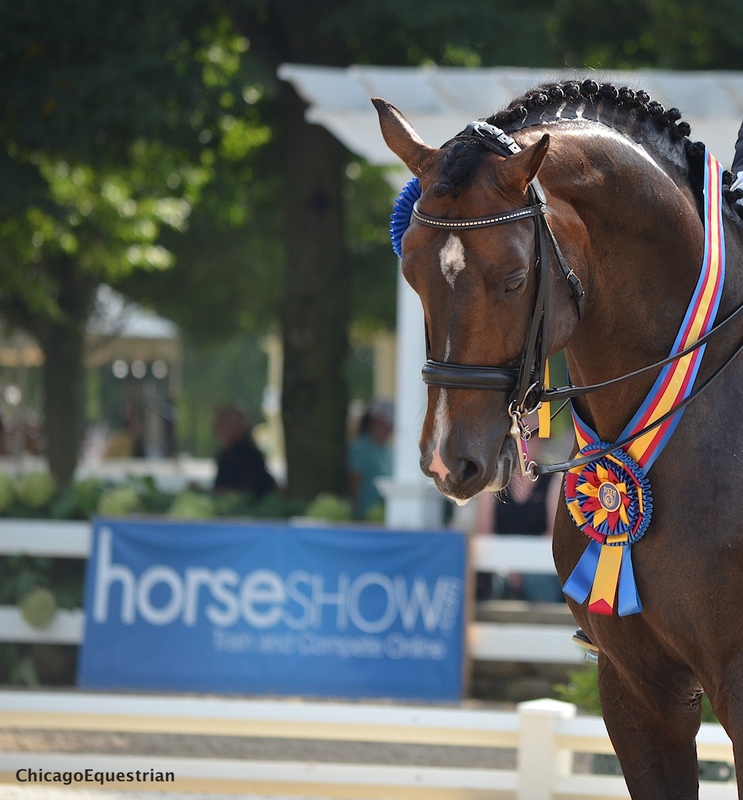 "(Fein Hardt) is a phenomenal mare, it's really an honor to get to ride her. I have been riding with Gwen (Blake) for six years now and she's taught me everything I know." Nicole Gallant and Parvus took home the bronze medal. Nicole Gallant won the bronze medal with Parvus earning a score of 84%. Gallant, 18, of Midland, MI, rides with Carrie Wilson and Sue Thome. This was Gallant's first medal finals and now she will head off to college. Next on the schedule, thirteen qualifiers rode for the Championship title in the FEI Six-Year-Old Final Test with Hemingway and Angela Jackson in the lead from Friday's first go. With today's scores counting for 60% of the total, it was Heather Blitz and Ripline, who took over the lead for the coveted prize. Ripline and Heather Blitz won the Six-Year-Old Championship. Ripline, the Danish stallion (Blue Hors Hotline x Riviera/Blue Horse Cavan DH) owned by Oak Hill Ranch in Folsom, LA, earned 8.4 for the trot, 8.9 for the walk, 9.0 for the canter, 8.8 for submissiveness and 9.0 for overall impression. The total score for the day was 8.82 with 8.30 from Friday for a total of 8.612 for the win. Ripline was also the highest scoring American Bred Horse in the six-year-olds. "I've had him since he was three and I've enjoyed everyday of riding him," said Blitz of Ripline. "I wish more were bred just like him." Blitz hopes to move on to do the Developing Prix St. Georges next year and hopes he'll make an international grand prix horse some day. Angela Jackson and Hemmingway were Reserve in the Six-Year-Old Final. Reserve went to Hemmingway (SPS Alsonara x Archipel) and Angela Jackson of Henderson, KY, who came into today's competition with the leading score of 8.38 from Friday and added 8.70 from today for a total of 8.572. Hemmingway, owned by Theresa Schnell, also won the high scoring Oldenburg award. Both stallions in the division are American bred horses with riders who sing the praises of the Young and Developing Horse Program. "I looked in the program book," said Bllitz, "and at least half of the horses are American bred and that's huge. Its encouraging that our country is getting good enough brood mares to compete with Europe." 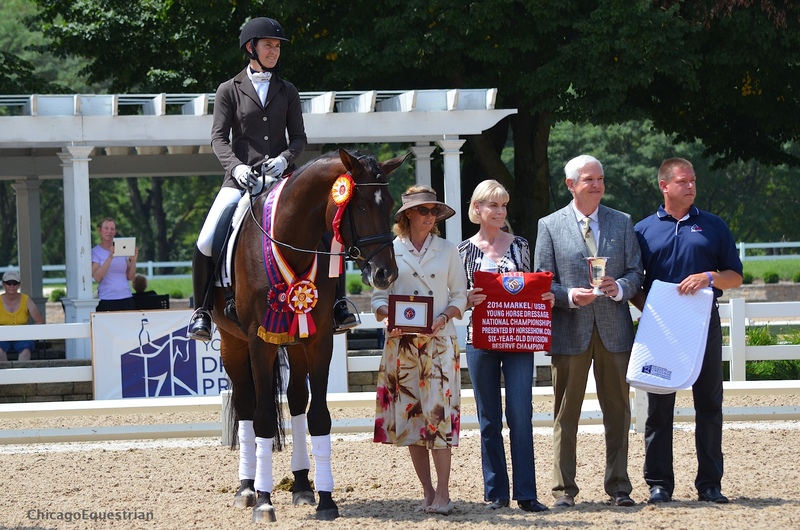 "I really think this program encouraged us to bring American bred horses here. I think it's helping the breeders put nice horses in good hands," said Jackson. 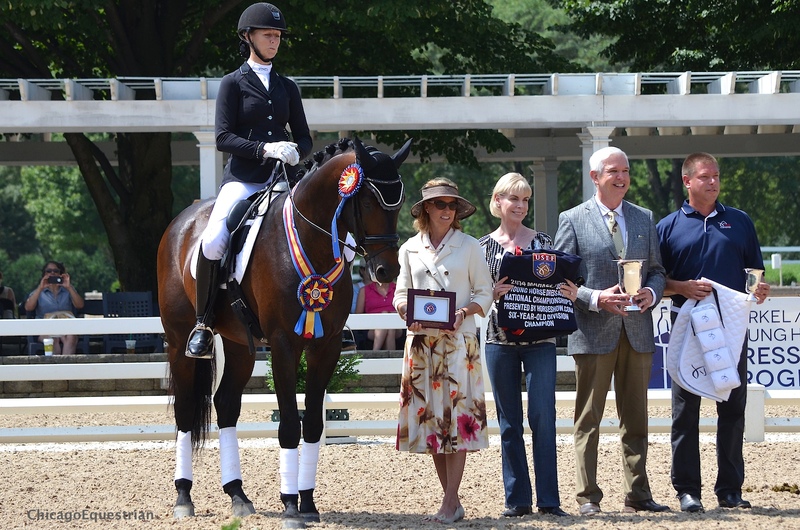 "The program helps develop good horses like Hemmingway, who has the potential to be an International Grand Prix horse." "I think we have plenty of good horses now in the states to choose from. The trainers need to go to US breeders first," said Blitz. "This program helps horses get the education they need to become good horses," added Jackson. Both riders thanked their breeders, Oak Hill Ranch for Blitz and Rock Solid Warmbloods for Jackson, for their support and great horses. 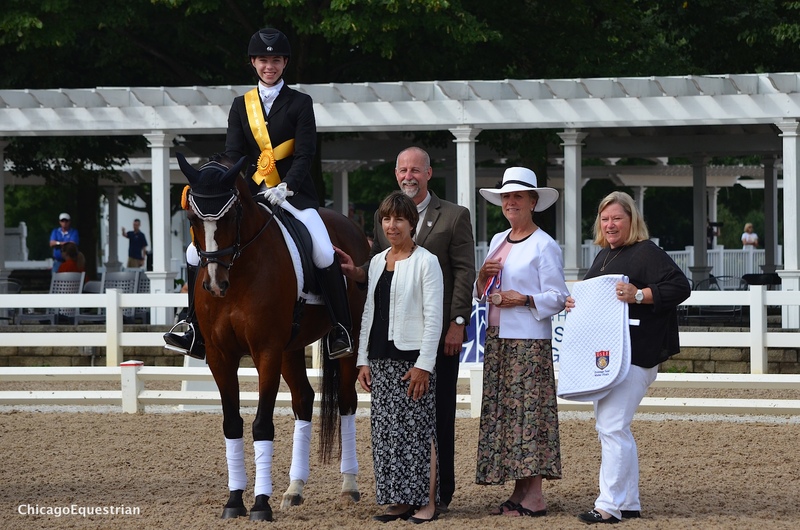 The final event of the day was the USEF Developing Horse Prix St. George Final. Fifteen horse and rider combinations executed the challenging test, trying to catch Friday's leader, Sanceo and Sabine Schut-Kery of Thousand Oaks, CA, with a 75.921 %. In the end, the only score that could beat that was Sanceo's second class score of 76.912 giving them an overall score of 76.516 for the Championship title. Sanceo (San Remo x Rivera/Ramior's Son II) a 2006 Hanoverian stallion from Germany and is owned by Alice Womble-Heitmann and Dr. Mike Heitmann of Hempstead, TX. First and foremost, Schut-Kery would like to thank her owners. "Without them this wouldn't be possible," said an emotional Schut-Kery. "The owners are so supportive and they trust and enjoy seeing their horses. It's such a fantastic feeling to have owners willing to give you what you need to do what's best for the horse. It just doesn't get mentioned enough. These are first class owners that are on board with the horse's best interest." Angela Jackson and Allure S were the highest scoring American Bred Horse, highest scoring Oldenburg and the Reserve Champion Prix St. Georges. Taking the reserve spot was Angela Jackson and Allure S (Rousseau x Sizarma/Farrington). The 2005 KWPN mare is owned by Kerrin Dunn and is U.S. bred. Allure S was also the highest scoring Oldenburg and the highest scoring American Bred Horse. Jackson is extremely proud that all the horses she has ridden in the program have been American bred and she hopes more breeds get involved in the program like the Oldenburgs have to educate up and coming riders and owners. Jackson also agreed with Schut-Kery that without their fantastic owners and sponsors like Markel, none of this would be possible. "It takes owners who care and understand that the ultimate goal is to make FEI horses. We are lucky we have owners that understand the horses have of be cared for and managed to be successful," said Jackson. "The program is one part but the owners are also an important part," added Schut-Kery. Both riders will continue to participate in the Young and Developing Horse program as they move toward making their horses into top FEI horses. Lamplight Equestrian Center will host the Championships in 2015. 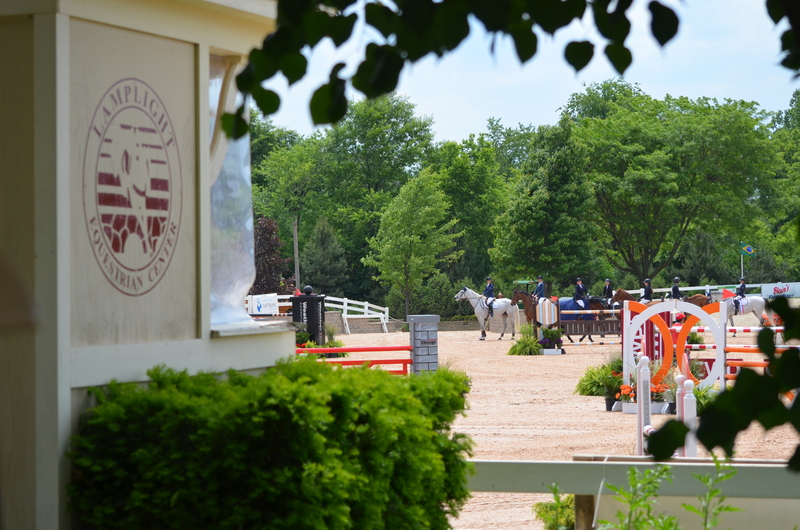 The facility has been host to a number of prestigious horseshows including the American Eventing Championships and the U.S. Para-Equestrian National Championships in addition to countless first-class Hunter shows, Jumper shows, Eventing competitions, Dressage shows and Sporthorse Inspections. For more information on Lamplight Equestrian Center, contact Anna Margalef at 630-546-5576 or annam@lamplightec.com or visit the website at www.lamplightequestriancenter.com. For more results please visit www.foxvillage.com. For more information on the Markel/USEF Young and Developing Horse Program please visit www.usef.org.